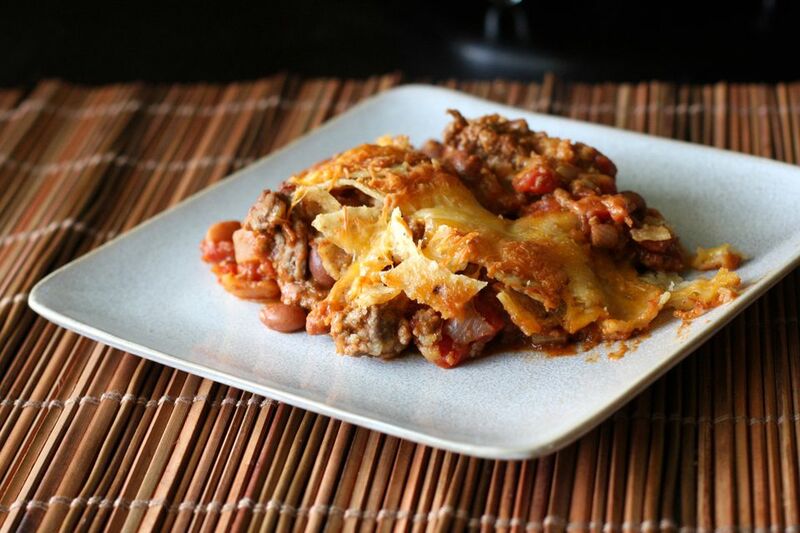 This Tex-Mex casserole is a well-spiced combination of ground beef, chopped vegetables, cheese, tomatoes, and pinto beans. Tortilla chips are layered with the ground beef mixture. If you like heat, use pepper jack cheese and add some finely chopped jalapeno or serrano peppers to the beef mixture. Or add some cayenne pepper. Serve this casserole with a tossed salad and cornbread, if you like. Grease a 2 1/2 to 3-quart casserole. In a large skillet over medium heat, brown the ground beef in olive oil with the onion until onions are lightly browned and ground beef is no longer pink. Drain and discard excess drippings. Add the bell pepper and garlic to the beef and continue cooking, for about 2 to 3 minutes, until bell pepper is tender. Add the pinto beans, tomatoes, chili powder, and cumin. Cook until hot and bubbly, stirring frequently. Break tortilla chips into smaller pieces and put about half of them in the bottom of the casserole. Spoon about half of the beef and bean mixture over the chips and sprinkle with half of the cheese. Spoon the remaining beef and bean mixture over the cheese layer. Top with the remaining chips and cheese. Bake for about 25 minutes, or until the casserole is bubbly and the cheese has melted.